Wayne Tech and S.T.A.R. Labs have joined together to harness dark matter particles as a renewable and clean energy source. The two firms jointly built an orbiter to conduct their experiment and Bruce Wayne even talked Superman into letting them using a Kryptonian processor to control the immense flow of data. During the experiment the accelerator charges off the scale and not only did an explosion rock the orbiter but what appeared to be the original incarnation of the Teen Titans suddenly materialized before the startled scientists. John Henry Irons orders Bruce Wayne out of the room as he tries to contain the damage and reluctantly Bruce does. He enters the hallway and opens his shirt to reveal that it isn't Bruce Wayne but Superman in disguise. Superman re-enters the room and tells John to make sure everyone is safe while he handles the situation. As Superman learns that physical attacks are doing him no good one of the techs comes into the room and approaches the crystalline processor. The fight with the "Titans" is taken into the hallway where Superman discovers that inside the dark matter structures is a projector of some sort. He grabs at "Aqualad" and after destroying the projector the construct disappears. Back inside with the Kryptonian processor the supposed tech touches the structure and a bright light envelops him. On Earth in the Fortress of Solitude Dr. Light materializes in another bright flash. He begins to talk to himself about the weapons he is going to find when suddenly Batman comes out of the shadows. They fight briefly before Batman distracts the villain with a concussion bomb. Accessing the Kryptonian processor Batman brings some of the dark matter to the Fortress of Solitude. The matter envelops the room with darkness, which takes away Dr. Light's powers allowing Batman to subdue the villains with veritable ease. After Superman takes out the "Titans" he joins Batman at the Fortress of Solitude. Batman explains that Light simply vanished though Batman believes that Light might have been pulled into the crystal while in his photonic form. While they discuss the failure of the experiment and where the villain went Dr. Light suddenly appears before a shadowy figure. When Light asks who the figure is and what he wants the figure replies that what he wants is the real question. Story - 4: It's pretty much a known fact that if Dan Abnett and Andy Lanning write a story than it is going to be good. Seriously. I've never seen evidence to the contrary so I'm pretty certain of that fact. Those two can write anything. What they wrote for this title was a good once and done story that I really enjoyed. It had solid dialogue, a good bit of action, Superman and Batman acting like Superman and Batman and evil, dark matter constructs of the Teen Titans. I ask you what more could you want from a comic book? Well, that's not all it had. Abnett and Lanning crafted a tight story that played to best of both Superman and Batman. John Henry Irons made an appearance and there is never enough John Henry in the current DC Multiverse. There was some old school Superman dressing up as Bruce Wayne business going on, which I liked despite the Silver Age feel to it. The structure of the story worked as well, especially when Batman finally made his appearance. It felt right. Dr. Light shows up in the middle of the Fortress and suddenly Batman leaps out of the shadows. That was great. I also liked how both Superman and Batman got their chance to shine. 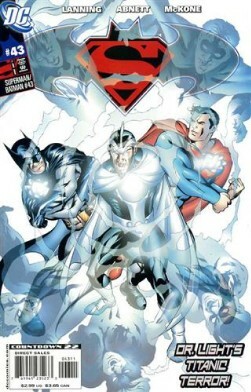 Superman used his abilities and his brains in taking down the "Titans" and Batman did the same with Dr. Light. One didn't look any better than the other. I know it might sound odd to want there to be some balance, but there are the times when Superman and Batman work together that Batman gets the better end of the deal. It's a small thing to like, but worth mentioning. So yeah, this was an entertaining and more importantly good issue of SUPERMAN/BATMAN. After the last few stories it was almost refreshing. Art - 4: I've enjoyed Mike McKone's art since his work on SUPERMAN back in 1999. I especially like what he did on TEEN TITANS with Geoff Johns, so it's kind of like getting the best of both worlds in this issue. He drew Superman again and he got a chance to do the Titans in a round about sort of fashion. He also is one of the few artists that can draw Dr. Light as a credible threat. Add all that up and I was very satisfied with the art this time out. Man, it's been a good week for me as far as the books I read. I hope this keeps up. Cover Art - 5: This was a great cover. I can't find any fault with it. All of the characters look good, it has some neat effects to it and while the scene didn't happen inside and while it kind of spoils who the villain is I think it is a fantastic piece of art.